My Southern trapline is mostly devoted to beaver control work, and I equip myself accordingly. Last year, however, two clients asked if I could also trap some coyotes for them. Well, yes, I could. I already was trapping bobcats as a sideline on some of the land where I trapped beavers, and I could use those traps for coyote sets, too. My main bobcat trap was the No. 3 Victor Soft Catch, four-coiled with padded jaws (a legal requirement on that ’line). My secondary trap was the No. 1-3/4 Soft Catch, also four-coiled. A No. 1-3/4 padded-jaw trap is a little on the small side for coyotes (cats, too) but good enough. However, I hadn’t brought enough of either trap to also handle the coyote trapping, so I had a dozen BMI No. 2 Cushion Catch traps shipped from home. Coyotes are hard on traps. They beat them up, wearing off the protective coating and occasionally breaking or bending something. And coyotes are not just hard on traps, they also are hard on the supply of traps. With cats, I may use the same trap the whole season. I may even move a scent-contaminated trap from one set to the next. Cats just don’t care. But you better use a clean trap at a fresh coyote set, or it will get dug out. With people paying me to trap coyotes, I also decided to invest a little money in the project and build another dozen padded-jaw traps specifically for coyotes, from the ground up. As a base for my special-built coyote traps, I chose No. 2 Bridger offsets, well-built traps that lend themselves to modification. I also ordered a dozen J.C. Conner rubber jaw conversion kits. The rest of what I needed was already at hand. When I rework a trap this way, the chain comes off first thing. It makes the trap much easier to handle. To remove the chains from these traps, I used an S-hook tool to spread the rivets where they hooked to the large square “rings” that encircle the bases. That is a good place to fasten a chain, and I would refasten it there. But the chain would need a little work, first. Next, the pan and dog came off. With this pan, I just unscrewed the bolt. The dog was a little trickier. To open the eye of the dog, I inserted a pair of side-cut wire nippers into the gap in the dog closure. When I worked the handles, the jaws of the nipper wedged open the eye of the dog. Then, I expanded the gap with a stout screwdriver. The fastener on the bottom of the trap, the large square wire ring, also needed attention. It is so big it can jam up underneath the trap. I considered several alternatives, but the quickest fix seemed to be welding a little bar across the ring underneath the trap frame, to keep it from rising up. The finished attachment looked a lot like a miniature belt buckle. The jaw conversion kit consisted of pads with thick steel retainers that bolt on top of the trap jaws with the pads inserted underneath. To install, I put a retainer on a jaw and held it in place with a couple of pairs of small locking pliers. Then I clamped the trap onto a drill press and bored through the holes in the retainer, down through the trap jaw. The retainers are held in place with four No. 6 machine screws and lock nuts. Before I loosened the clamps on these jaws, however, I inserted and tightened only the two top screws. I didn’t install all four screws because, same as the chains, I’d later be removing and reinstalling the jaw pads, too. I always remove the jaw pads before boiling and waxing a trap. The pads I boil separately, and I don’t wax them. After that, I fully assemble the jaws. During this treatment, the springs stay on the trap to hold everything in place. But now, it was time to “unspring” these traps and remove the U-pins. Then I turned my attention to the trap-triggering system. I chose Paws-I-Trip pans to get 3 to 4 pounds of pan tension through mechanical advantage alone. The PIT system can’t go out of adjustment since there is no friction involved, no bolt to tighten. It’s rugged and dependable. I like 3 to 4 pounds of pan tension for coyotes or cats. It prevents a bunch of smaller animals firing off the traps yet still is plenty light enough for even a juvenile coyote. I don’t want to catch and maybe have to pelt-out a bobcat that is too small to spring a 4-pound trap. The PIT kit for this trap has a unique feature. The replacement pan clamps onto the U-pin. That is its hinge point. I crimped the slots in the pan legs over the U-pin, and for added insurance, I tacked them closed with a little weld. The new PIT pan also required a PIT dog. With the PIT system, the pan wants to lift up (that’s the mechanical advantage at work). To hold the pan level, there must be a stop at the end of the dog that the pan hits against and stays in place. The standard PIT dog looks pretty much like any other dog, except for the small stop bump stamped near the end. There also is a “rod” dog made of heavier round stock. These dogs are tough, and that’s good because coyotes like to chew and bend dogs. 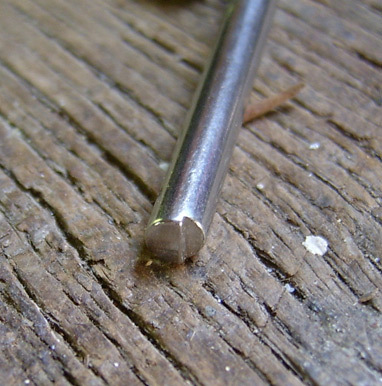 Instead of a bump, a little notch is filed at the end of the rod. To set it, you slide the dog under the pan and then pull the pan down until you hear or feel it “click” into the notch. In effect, it’s a built-in nightlatch. I put a set of springs on one of the U-pins with the pan attached. Then I had to steer each end of the pin through the holes in the levers and the holes in the trap frame, and both ends pretty much had to go at once. It can be a little tricky, and it’s much easier to do if you first clamp one of the trap hinge ends in a vise. Once everything is lined up, you can pry the springs back under the levers. But I was not quite done with these traps. Adding the rubber and retainer made the jaws both wider and heavier. For that reason, I wanted to four-coil the traps for a little extra power coming up out of the ground. It would be very easy to overdo this four-coiling, because the springs that came with the trap were good and strong. The booster springs I added were smaller, supplied specifically for this application. The U-pin is also extra long, so it is easy to just slip the springs over the ends of the pin and pop them in place behind the levers. With everything in place, it was time to set the trap and level the pan, which I did by bending the end of the cross frame where the dog attached. I built a tool for that many years ago. Now, it was time get back to the chain and fastening system. Putting a trap on a critter is only half the battle; you also have to hold onto the critter, and coyotes can be difficult in that regard. I decided to completely revamp the fastening system on these traps. I removed the end swivels and cut the original 10-inch chain roughly in half, so I could install a swivel in the middle of the chain, too. The swivels that came with the chains would have been OK to reuse. But to save maybe having to replace them later, I decided to just go with all heavy-duty crush-proof swivels. Coyotes can and do mangle ordinary swivels. The reassembled chain had a swivel at the top, a swivel in the middle, and a swivel at the bottom. I would be using quick links (the handiest fasteners I know) to attach cable stakes or drags to these trap chains. So when I installed the J-hook in the end swivel, I also gave it a special crimp. Just mashing a J-hook down usually leaves an oblong hole that quick links don’t always thread through. Instead, I put a 7/16 drill bit inside the bend and crimp the rivet around that to make a nice round opening. To reattach the assembled chain to the trap, I crimped another J-hook around the bottom of that modified “belt buckle” fastener on the base of the trap. 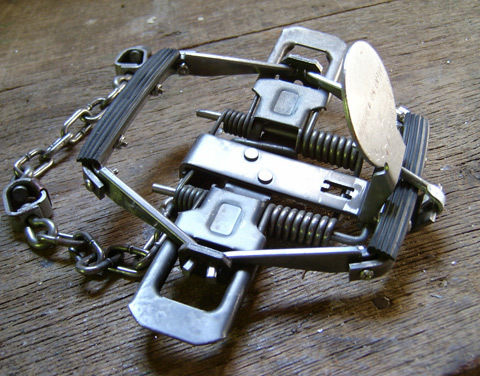 The full trap-securing system now had six swiveling points that would lessen the chance of a jammed-up trap chain, and that would lessen the chance of a coyote forcing its way out of the trap. I’d made a dozen souped-up padded-jaw coyote traps that met all of my own specifications. If I had shopped around, I might have found ready-made traps with most of these features. Victor, Duke, Bridger and others all offer quality padded-jaw traps at prices commensurate with what I had spent to make my own. 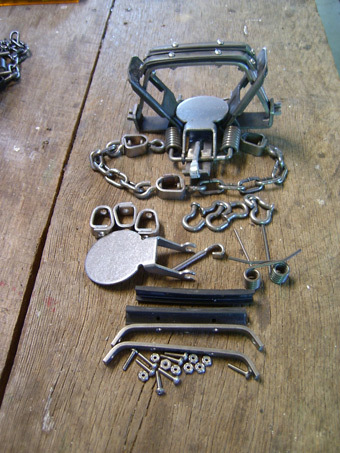 The original traps cost $122, the pad kits $35, the PIT kits $40, the four-coil kits $14, the crush-proof swivels $18. The total for a dozen padded-jaw coyote traps was $229, not counting the J-hooks and the time I had spent on the project. A lot has been written about modifying traps—maybe too much. Virtually every trap made today is serviceable right out of the box. Yet most can be made at least a little better for a specific application, and I am one of those guys who likes to tinker with traps. I get a sense of satisfaction building traps that exactly suits my needs. I get an even greater sense of satisfaction catching critters with those traps.